Video games and computer games are heavily marketed toward teens and young adults, but recent studies show the average video game addict is 35 years old. The research also shows that compulsive gamers are more likely to be overweight and more likely to be depressed than the general population. Female gamers reported greater depression and lower health status than non-players. Male gamers reported higher body mass index and more internet usage than non-players. Both male and female gamers demonstrated greater reliance on the internet for social support. 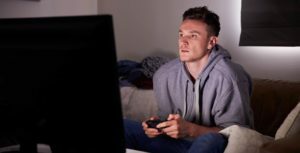 Like teen video game addicts, adult gamers were more likely to be socially withdrawn, sacrificing real-life social activities to play video games, and were more likely to lead a sedentary lifestyle and be overweight. According to a Pew Internet & American Life Project Survey, more than half (53 percent) of American adults play video games, and about one in five adults (21%) play every day or almost every day. Adolescents and young adults tend to dominate the gaming scene, but adults tend to be more avid players, playing more frequently and thus sometimes falling prey to video game addiction. These findings were echoed in a 2018 consumer survey from Entertainment Software Association, which found that 70 percent of video game players are over the age of 18, and the average game player is 34 years old. Males account for 55 percent of gamers overall. Although adults tend to have more social and professional responsibilities than teens, roughly one-third of adult gamers still find time to spend 10 hours or more playing video games every week compared to 11 percent of teens, according to a report by the Consumer Electronics Association (CEA). The statistics show that adults are less likely than teens to play online games or on video game consoles, preferring instead to play on the computer, and are less attracted to massively multiplayer online role-playing games (MMORPGs) like World of Warcraft than teens. As we mentioned, men aren’t the only ones getting hooked on video games. The CEA survey found female gamers outnumber male gamers in the 25-34 age category. Although most of us picture a teenage boy at the helm of the video game console, the research shows that many adults enjoy playing video games just as much as teens. As a result, some adults will find themselves addicted to gaming. Video game addiction affects teens and adults all over the world, and though the U.S. has been slower than countries like China, South Korea and the Netherlands to develop gaming addiction treatment programs, effective interventions are now available all over the country. For adolescents and young adults, therapy programs and residential treatment centers tend to be the most effective at pulling youth away from the computer or video game console and helping them reconnect with friends, family and healthy pastimes. Adults suffering from video game addiction often benefit from 12-Step addiction treatment programs and centers designed to treat a wide range of compulsive behaviors. Adults have a lot to lose when video games begin to consume their lives. Getting help will ensure that you not only come back to reality but that you create a reality that you’re happy to be in.